ALV Stompbox International boutique was born in 2008 by Mr. Agus Alfa F., electronics designer, sound character designer and a guitarist. ALV also features an attractive graphic design designed by Irvan Hasyim. 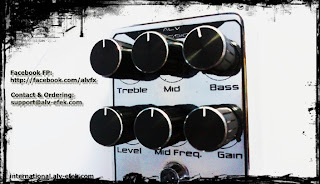 ALV provides various types of guitar effects such as Tubelyzer, Delay, Crunchivity, etc. and various character sounds like overdrive, high gain distortion, distortion, modulation, etc. ALV produces amazing sound and compete with world-class guitar effects. In the production process, we always check the quality at every step in assembling the parts of the product ALV. We also did a lot of research and development, makes ALV to be superior than the existing basic schemes. So ALV optimistic compete with international products and we guarantee it will be safe to be marketed in the international. ALV Pedal/Stompbox designed and assembled one by one by hand and tested good by standard regulation to produces hi quality products at our ALV home-industry and music studio placed on Banyuwangi, Jawa Timur, Indonesia. Our studio address: Sumberjo RT04 / 1, Wringinagung - Gambiran, Banyuwangi, East Java, Indonesia. We use True Bypass switching in all our pedals. Most other pedals have a buffered output that destroys the performance of most pedals. - Will run on 9V battery or BOSS or Ibanez style dc adapter (negative centre), etc.